The Obama administration estimates that close to 8 million borrowers will be affected by the student loan initiative trumpeted by the president in a speech at the University of Colorado-Denver on Wednesday. But more than 36 million Americans currently have federal student loan debt, meaning that the administration's proposal -- a two-pronged approach aimed at consolidating and capping loan payments for certain borrowers -- will target only a fraction of the problem. But that problem is admittedly immense: The total amount of outstanding student loan debt in the U.S. is set to cross the eye-popping $1 trillion mark for the first time this year, according to a paper from the Federal Reserve Bank of New York, as reported on by USA Today. The White House is touting its latest measures as part of an effort to advance economic policy by executive order, bypassing the blockage of congressional Republicans. The administration's statement emphasizes that borrowers may be struggling to manage bills and support families, and the plan will put more money back in their pockets. Nevertheless, the effects are not expected to be enormous, given the plan's limited nature -- a reflection of the president's need to act without congressional support. "These are not radical things," The Wall Street Journal's Laura Meckler explained. "If you're going to go out and make a big case for re-election, these are not the kinds of things you run TV ads on. These are fairly small, targeted measures." The new plan lets the approximately 6 million borrowers consolidate two student loans (a private loan and a government loan) into one at a lower interest rate -- a reduction of up to 0.5%. Instead of making two payments a month, these borrowers will make one. 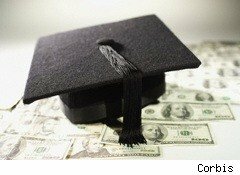 Consolidation benefits those who took out student loans under the old system -- ended in 2010 -- in which loans were privately-issued but government backed, known as Federal Family Education Loans. All new federal student loans are now direct, government-issued loans, but there are $400 billion in old-style loans outstanding. Those who want to participate in the consolidation initiative don't have to do anything just yet. Early next year, the Department of Education will contact qualified borrowers and provide more information. The press release offers an example of potential savings, saying that a borrower with two loans totaling $37,500 can expect to save nearly $1,000 in interest. The White House estimates that more than 1.6 million student borrowers could see their monthly payments drop under this part of the plan, which basically speeds up an initiative announced last year dubbed "Pay As You Earn." Currently, borrowers can cap their monthly student loan payments at 15% of their discretionary income. That figure is scheduled to drop to 10% on July 1, 2014. But with the accelerated "Pay as You Earn," some borrowers could access this option in 2012. "A nurse who is earning $45,000 and has $60,000 in federal student loans. Under the standard repayment plan, this borrower's monthly repayment amount is $690. The currently available IBR plan would reduce this borrower's payment by $332 to $358. President Obama's improved 'Pay As You Earn' plan will reduce her payment by an additional $119 to a more manageable $239 -- a total reduction of $451 a month. Borrowers wondering whether they qualify for income-based repayment can visit www.studentaid.gov/ibr for more information. 3. "Know Before You Owe"
The Department of Education is teaming up with the Consumer Financial Protection Bureau to create a model financial aid disclosure form, informally dubbed a "Financial Aid Shopping Sheet," which would allow "colleges and universities ... to help students better understand the type and amount of aid they qualify for and easily compare aid packages offered by different institutions," in the words of the White House statement. The intent is to produce student borrowers who understand their monthly loan payments post-graduation, as well as additional costs not covered by financial aid.